discover what my spirit is telling my inner artist to create." When these words came to me...all I was seeing was blue. 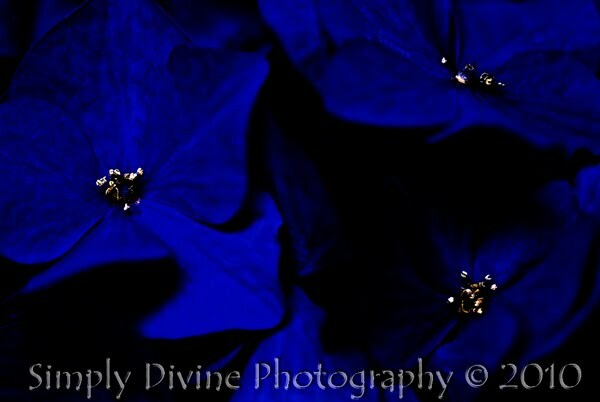 I was completely immersed in a Blue Funk. Blue in my mind, blue in my heart, blue in my soul and blue in my spirit. The music I was hearing even sounded blue to me. ALL BLUE. 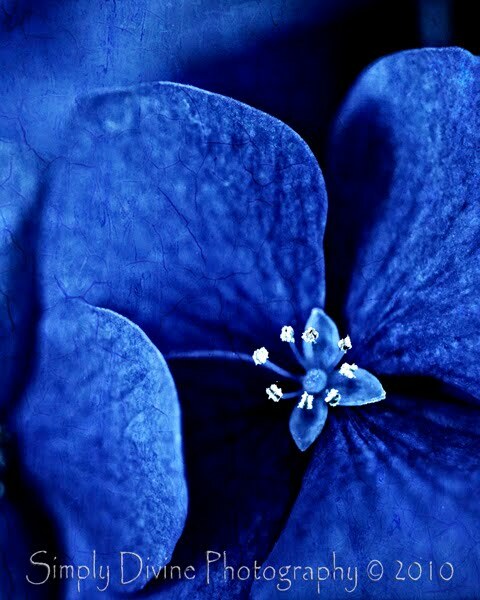 No other color would do but BLUE. This posed a problem though...what could I find to signify the profound, deep hues of blue I was seeing in the darkness of the night? It was almost 3:45 in the morning when I started looking around the family room for something that was blue...the right kind of blue...a deep, rich, compelling blue with shadows of light and dark mixed in like the dark blue velvet of the night sky just before the sun fully sets. I could picture it so well in my mind, but here I was stuck in my home in the middle of the night...dark outside, mostly dark inside except for a small desk lamp and the light from my computer screen. The light blue of the background from Windows 7 were annoying me, the sky blue of my lens cleaner cloth on the desk, the blue of a candle on top of the cabinet, the different shades of blue book covers in the library shelf, the cover of my current journal on the desk beside me, the blue light that was lit up on the "on" button of my smaller printer, the blue flashing on the wireless router for my internet, these last two were closer...but they just were not what I was seeing in my mind... the blues surrounding me were all wrong because they were so far from the deep, luxurious, elegant, royal blue that was saturating my mind & enveloping my very soul. The basket was filled with beautiful items, many were personalized with Will's photo & name, such as: a Christmas ornament, a license plate frame, candles, books on hope, a CD of comforting songs...so many beautiful things, & she had made a personalized keychain with William's picture on one side & a song I wrote on the other...She had gotten them from the Memorial Program we had made for William's service...I didn't even know she was there, but she had seen the search & on the news & found out from the newspaper when the service would be held. The picture of Will on the front of the cover was the one she used for the keychain & in that picture he was wearing a deep, royal blue shirt. 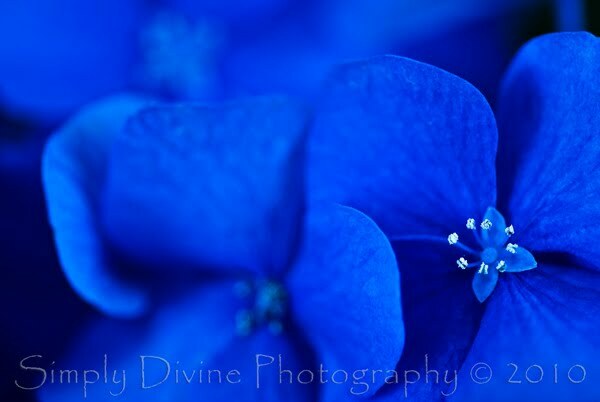 This was the blue I was seeing in my mind...but what could I find to match that color to begin creating "Blue"? Well, it was so hot here in my home, so I went in the kitchen to get a drink of water and there on my table, forgotten while at the computer in the family room, I saw my white ceramic pitcher filled to overflowing with the first cuttings of the darkest Blue Hydrangeas that I have ever seen....this was the color...these Blue Hydrangeas would be my subject. The winter before last, I had gone to the nursery to find out what to feed my Hydrangea plants to make them blue, because while the Hydrangea is my favorite flower, (along with the Old English Roses) the blue ones are my favorite....so I bought the product they recommended & followed the directions to apply it at the base of each plant 3 to 4 times during the dormant & early spring. Well, I did that and more...about 5 or 6 times and used quite a lot of it because I wanted all of my hydrangeas to be blue in spring of 2009...well, I guess I gave them way too much because what I got was a lot of branch & leaf growth but just a very few pinkish, lavender blossoms. 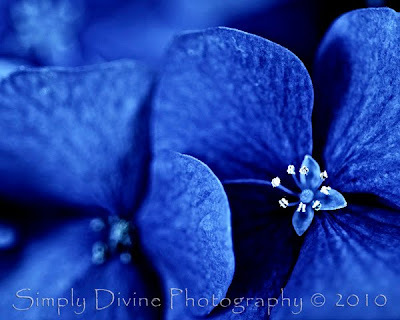 After what happened last winter & spring, I didn't give them any at all, and this year I was blessed beyond measure with literally loads of the deepest Blue Hydrangeas on all of my plants that I have ever, ever seen on any Hydrangea plant. Two days prior to this night, I had cut a huge bouquet of them to fill the white ceramic pitcher on my kitchen table...I keep it filled with water until they are dry and crispy. They are gorgeous & very pretty when dried. I have vases of them in several rooms from prior years dryings. But, here at last, my quest for the right kind of blue had ceased! Now, just to compose a masterpiece from these blue beauties. 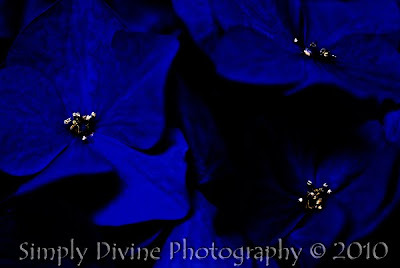 I took a some raw file photos of the flowers in the vase, using no flash, a fluorescent white balance and an ISO of only 100...by the time I was done, it was beginning of first light. Knowing there would be enough light to get photos outside without waiting for the sun to rise, I set the white balance to cloudy and snapped a lot more raw file photos from the live plants outside. On these the tiny little center flowers with the white stamens were still open and fresh without the signs of withering like on the bouquet on my table. Then began the post processing...it was time to adjust the exposure, contrast, levels, sharpening, temperature, clarity, vibrancy, blacks, hue and saturation, dodging and burning...just like developing film in the darkroom during days gone by...only now we do it digitally on the computer. 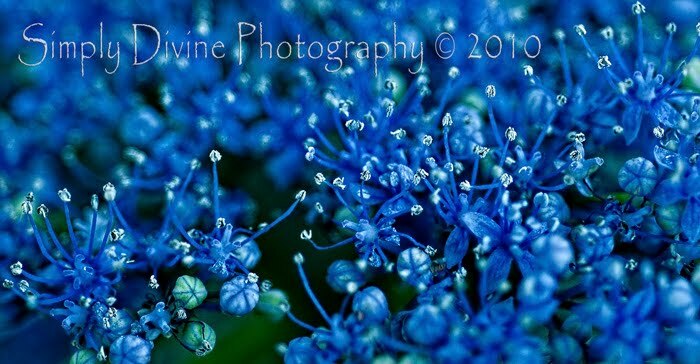 I created several different versions and crops of a few of the photos and finally felt I'd reached my goal when I created the Blue Hydrangea At Midnight which is the first photo in my series of the blue streak on this post. This one was from the series I took in the kitchen under bright fluorescent lighting. But even though I felt so blue and filled with despair...the scripture never ceases to uplift, " Blessed be God, even the Father of our Lord Jesus Christ, the Father of mercies, and the God of all comfort; Who comforteth us in all our tribulation, that we may be able to comfort them which are in any trouble, by the comfort wherewith we ourselves are comforted of God."